I will have to do something about that. I’m looking for a suitable set of drawers to put under the layout, below the sector plate. Since they need to be pretty shallow to make best use of the space, I expect I’ll have to build my own. No rush on this. I should remove some of the excess equipment from the sector plate area – including that beautiful (but entirely inappropriate) S scale version of the Flying Yankee. (What can I say? 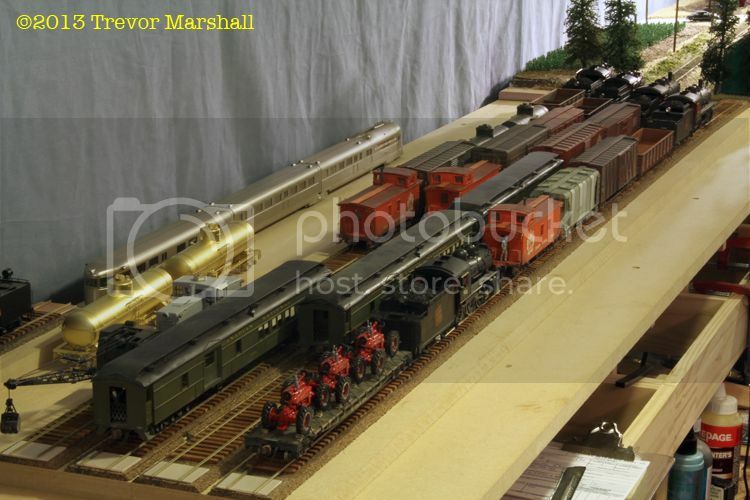 I used to model the Boston and Maine in HO and thought the River Raisin Models import would make a lovely mantlepiece model…) I need to paint and finish the brass tank cars too – but in the meantime, they can go back in the display case in my office. This entry was posted in CNR locomotives, equipment, sector plate by Trevor. Bookmark the permalink. I brought it downstairs to show some visiting S scale enthusiasts and it just hasn’t made it back to the display cabinet. I use a small chest of drawers meant for storing baby’s clothing, the drawers are shallower than normal. You get 6 drawers in the same space used by 4 regular drawers. I’m not sure if it will work with S scale since I model in HO, but I hope it helps you! Great idea – thanks! I’ll see what I can find. Perhaps a search through the online Ikea catalogue will turn up something useful. I like the lineup of locos with their flags. Do you have plans to use the UK-style cassette tracks on your sector plate and drawers to minimise handling of your excess stock? Thank you – I do too. At this point, no plans for cassettes. I’ll acquire/build the drawers first, then figure out how I’m going to use them. I’m not too worried about excessive handling. The S scale equipment is pretty robust – I’m regularly turning the locomotives by hand – and any damage to paint/weathering can always be fixed with some touch-up airbrushing. Why not replace one track on your sector plate with space to hold a cassette, and have some simple storage at the rear, say a 12″ high frame with support brackets every 4″ up, spaced at 2′ intervals? You could store 2 extra trains that way. That’s an interesting idea. Thanks! I’ll certainly add it to my list of options.